An empty canvas is great if you’ve got the imagination to do something with it. Sometimes, though, it takes a little push to get the creative mojo going. That’s the thinking behind Mix, a new collaborative platform from FiftyThree, makers of the popular iPad sketching app, Paper. Built right into the app, it’s based around a continuously expanding pool of shared content that’s available for anyone to mix, remix, and draw inspiration from. The whole thing is based on a sort of utopian vision of digital creativity. Everything in Mix is available for you to rework as you wish, and everything you rework becomes available for others in the same way. According to FiftyThree co-founder Georg Petschnigg, Mix has been part of the vision from the start. Paper, the company’s first offering, was all about thinking, he explains. Pencil, the thoughtfully designed iPad stylus released last year, helped facilitate the act of making. (With iOS 8, Pencil will be getting a pressure sensitivity feature, increasing its capabilities). It isn’t necessarily what you’d expect from a collaborative platform. Unlike, say, Google Docs, Mix doesn’t offer any way to work on things in private. Instead, it’s a free-for-all by design. Every piece inside of it is up for the taking. You can think of it as a fluid global game of Exquisite Corpse, except at any point a given work could be the head, the body, or the tail of someone else’s creation. In private tests over the last several months, the company’s seen the tool used in all sorts of ways. One widely riffed upon template was a blank “Hello, My Name Is” name tag. Others used it to sketch ideas related to fashion and architecture. You can view related collections in the app or through an accompanying website. 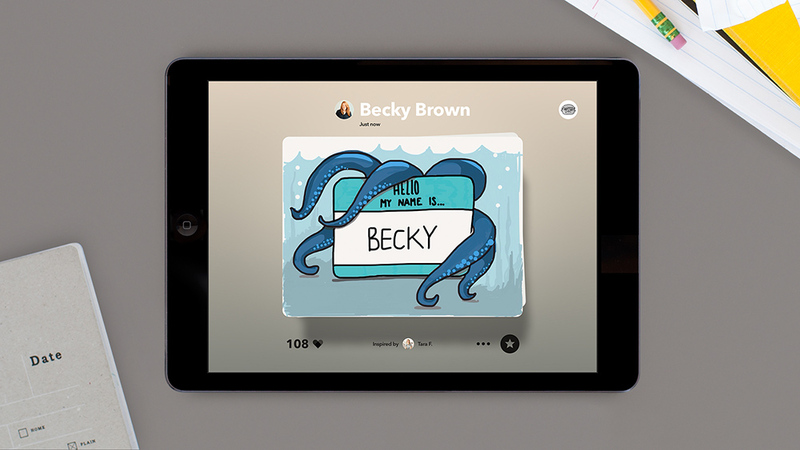 FiftyThree is content to wait and see how people use the tool before answering some of these questions. And indeed it’s hard to imagine what the platform might look like, say, three months from now. It seems at least possible that an environment in which output flows into a creative commons by default could actually engender a fairly limited range of output in the first place. Serious creative types want to share their work, sure. But serving up it up to be remixed ad infinitum is a different proposition. He likens it to another institution where creativity is king: Kindergarten. There, he says, youngsters are actively given a framework for expression. There are pages to color, pipe cleaners to bend into monsters, macaroni to arrange into a necklace. This article was featured on WIRED on September 16 2014 and was written by Kyle VanHemert, an author at WIRED Magazine.